I have not been cooking as much, as I was busy packing and unpacking. Yes, I am moving. More about that someday soon. I am missing my usual routine of cooking, shooting, eating and editing. All in that order. Last night, I felt like cooking something yummy + healthy for dinner. There are certain days when I prefer to eat really clean especially when I know that I have been putting a lot of crap in my body for the past few days. I recalled that I had a pretty chunk of salmon in the fridge and I was brainstorming for a new and simple recipe for salmon. This Honey Garlic Salmon with Warm Chopped Asparagus Salad was just amazing! No, it was beyond amazing. My mom has quite a finical palate, so it speaks a lot when she was full of praises for this salmon. I know I am constantly telling you how this is delicious and that is delicious. But when my mom confirms that a particular dish is good, then you should know that I’m not kidding. A thumbs up from mom is just like Gordan Ramsay giving a big nod in affirmation! 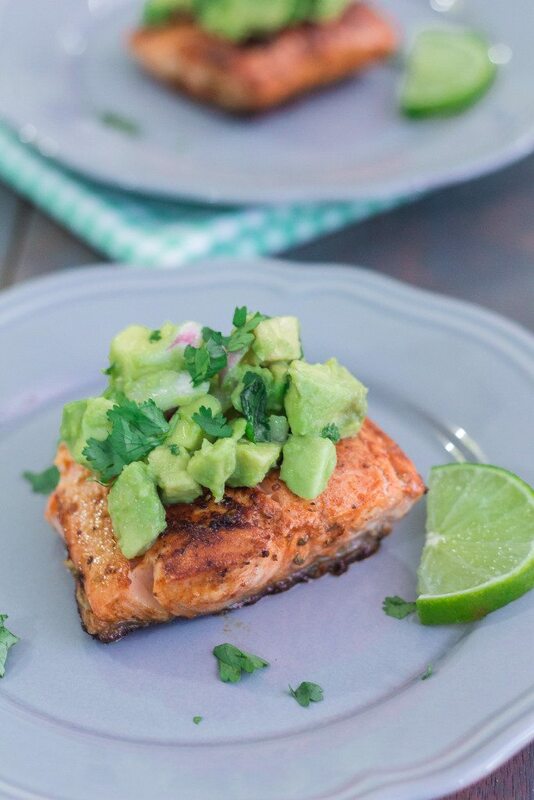 Back to the salmon, it was simple to prepare and when I say simple, I mean REALLY SIMPLE. 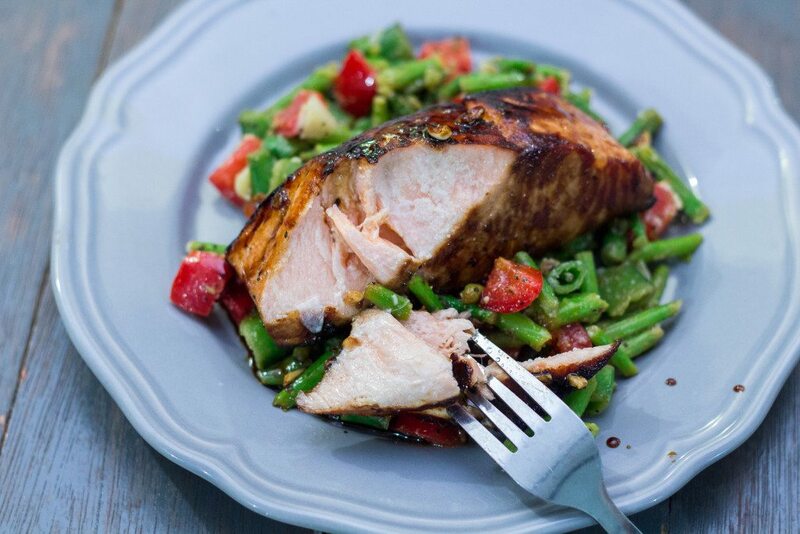 Marinate the salmon fillets, pan fry or bake it and then drizzle some sauce over the salmon just before serving. I pan fried mine as I wanted a slightly crisp and caramelized top on the salmon. If you are gonna bake instead, you can sear the top of the salmon over medium/high heat for 2 minutes before baking. Do give this recipe a try people. Simple + Delicious + Healthy. You are gonna make your family and yourself happy with this one. 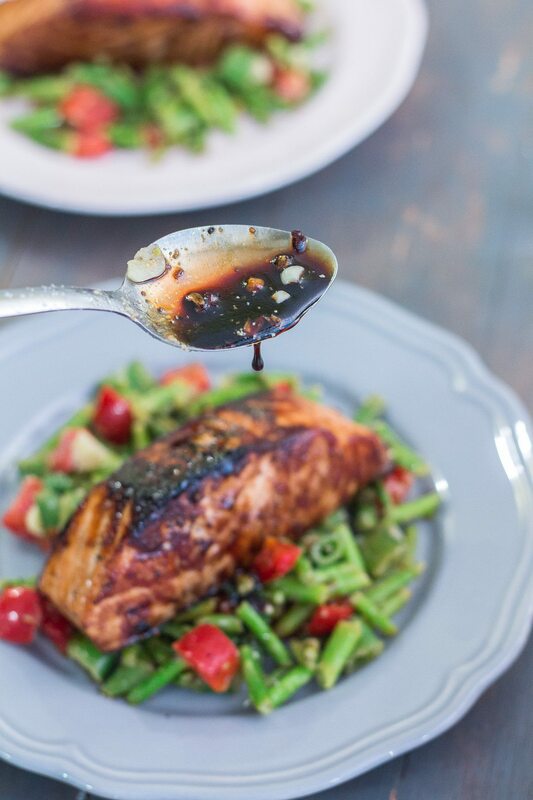 Combine the sauce ingredients and pour half of the sauce on the salmon and marinate the salmon for 15-30 minutes. 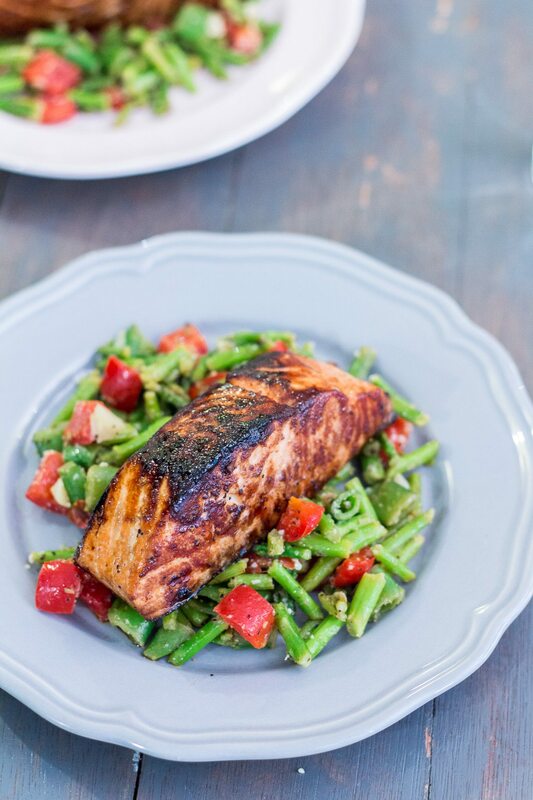 Heat a pan with 1 tbsp of olive oil and fry the salmon for 5-8 minutes on each side. Alternatively, you may arrange the salmon on a greased baking sheet and bake at 350 degrees F for 15-20 minutes depending on the thickness. For a slightly crisp and caramelized top, sear the top of the salmon over medium-high heat for 2 minutes before baking. Once cooked, dish and serve hot drizzled with remaining sauce. In a pan, add 1 tbsp of olive oil and saute minced garlic. Drop in peppers, snow peas and asparagus. Cook for 2-3 minutes and season with salt and black pepper. Turn off the flame and squeeze the lemon juice all over the salad and sprinkle with parmesan. Sedapnyer mayaaa. Boleh pengsan ummi tengok! Besok nak cari salmon. Kalau dah cuba nanti ummi feedback. 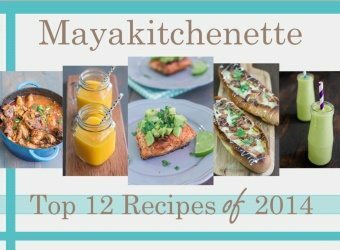 Kicap apa maya gunakan?